Before it started obsessing about copying Snapchat, Instagram’s main goal was getting your phone photos looking their best. The app’s smart image processing doesn’t have to stay locked on your mobile though—you can replicate the effects in Photoshop or any photo editor with similar tools. 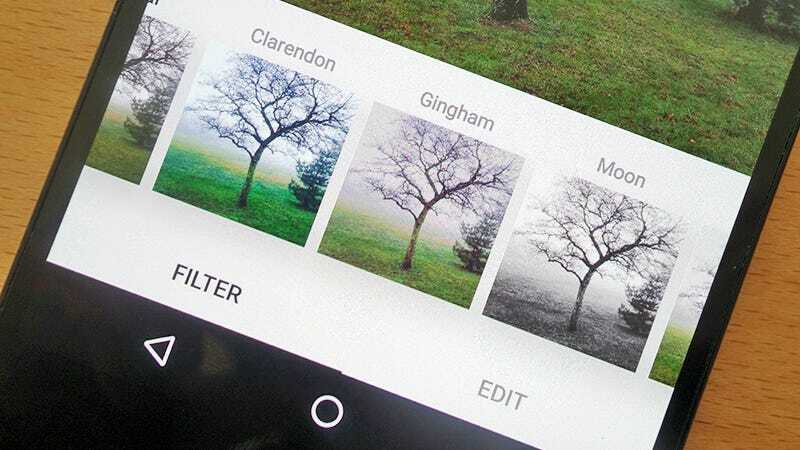 There are dozens of Instagram filters to pick from, dozens of different ways to replicate them, and an almost limitless number of possible combinations when it comes to adjusting these effects, so experiment with the settings we’re mentioning along the way—you might have to tweak these steps to suit your particular photos and might even be able to improve on the guidelines we’ve laid out here. You will, however, need a little experience in your preferred photo editor before hopping in, and please note the instructions below were created with Adobe Photoshop CS. Clarendon lightens lighter areas and darkens darker areas as well as picking out the most dominant color. According to Trick Photoshop, you can find the most dominant color in Photoshop by choosing Filter, Blur then Gaussian Blur and ramping the blur level right up. Click on one of the colors using the eyedropper tool to sample it, then copy the hex code. Next, select Layer, New Adjustment Layer and Photo Filter. Pick a color in the next dialog then click to edit it and paste in the hex code from earlier. Drag the Density slider up to 100 percent and ensure Preserve Luminosity is kept on. Then choose Layer, New Adjustment Layer and Vibrance and ramp up the saturation by 10-15 percent. Flatten the image and enjoy your Clarendon-ized photo. Amaro increases the exposure of your picture, giving it a film-like quality, while lightening the center and darkening the edges of the picture. You’ll first need to go to Image, Adjustments and Brightness/Contrast, setting the values to 60 and 12 respectively, or thereabouts. Choose Layer, New Fill Layer and Solid Color, then set it to a pale yellow (Photodoto suggests #fef7d9 for the hex code). Change the blending mode from Normal to Multiply in the Layers pane, and you should have a faint yellow wash. Flatten the image then go to Image, Adjustments and Levels, select the Blue channel from the drop-down menu, and drag the lower Output arrow level from 0 to 117 to add a blue tint to your picture. All of these values might need tweaking depending on the composition of your photo, and you can also reduce the contrast and play around with the midtones (via Image, Adjustments, Color Balance) for a more dramatic effect. Finally you’ll need to darken the edges of the image. Go to Filter and choose Camera Raw Filter. You’ll find Vignetting under the Lens Correction tab. Adjust the Amount and Midpoint sliders until you’re happy with the results. The classic Hudson filter on Instagram adds a bluer, cooler tint and a colder feeling, heightening the dramatic effect of shadows at the same time. According to Gram Of The Day you’ll, again, want to get started with a new layer via Layer, New Adjustment Layer and Curves, then make some adjustments to the blue, red, and green channels to create those blue-ish midtones and highlights. You can copy the curves plotted by Gram Of The Day or download the curves preset file that’s helpfully been provided. Though there’s also nothing to stop you from tweaking these settings yourself once you’re comfortable with how the whole process works. You may also want to make minor adjustments picture-by-picture. Next up you want to choose Layer, New Fill Layer, and Gradient, then click inside the gradient to edit it its colors. Set the left color stop to #8099be and the right color stop to #2f1b1b and hit OK.
Back on the gradient fill editor dialog, set the style as radial, the angle as 90 degrees, and the scale as 150 percent. Reverse and dither should be set to No, with Align with layer set to Yes. Hit OK again. Finally, set the layer mode to Overlay and the opacity to 80 percent in the main Layers pane, and you have your Hudson-ized photo. Next up is Mayfair, which gives your pictures a warm, pink tone, a thin black border, and some subtle vignetting—again we’re indebted to the instructions at Photodoto. There’s a lot of flexibility in this one, so you might need to play around a bit to get it right. First, create two extra layers: right-click on the original image in the Layers pane and choose Duplicate Layer. With your top layer selected, choose Image, Adjustments and Black & White to give yourself a black and white image. Click OK.
Photodoto suggests opening up the Levels box (Ctrl+L or Cmd+L) then playing around with the values if you’d like to. Next, go to Curves (Ctrl+M or Cmd+M) and create a subtle S shape like the one shown below. Hide the top layer via the eye icon in the Layers pane and switch to the second copied layer underneath, adjusting the Levels and Curves in the same way. You can then make the black and white layer visible again, but set the opacity to 50 percent. With any luck and maybe a bit of tweaking you should be seeing your Mayfair filter appear. With the top, black and white, layer still selected, create an adjustment layer (the circular icon at the foot of the Layers pane) and pick Gradient. Click on the gradient, select the Violet/Orange preset, then click OK; temper the effect by changing the blending mode to Soft Light (via the drop-down menu at the top of the Layers pane) and reducing the opacity to 75 percent or thereabouts. Finally add a vignette as explained in the Amaro filter section. Reyes is a vintage, dusty-looking filter that washes out color and reduces contrast. According to Trick Photoshop you’ll want to begin with decreasing the contrast. Layer, New Adjustment Layer and Brightness/Contrast gives you your extra layer to work with, then select the layer and pull the contrast right down. Add another identical layer with Ctrl+J (Cmd+J on macOS). That’s the contrast washed out, next for the color. This time you want Layer, New Adjustment Layer and Vibrance—knock the Vibrance right down (our guide suggests by 100) and you’ll see the filter is starting to take shape. Add a warm look with another adjustment layer, this time Photo Filter. Click the color swab and enter #f8b558 as the value, then increase the density to around the 44 percent mark. Last but not least, we’re going to up the brightness—Layer, New Adjustment Layer and Brightness/Contrast, then bring the brightness right up (Tricky Photoshop suggests somewhere in the region of 108). And there you have it: your washed out, vintage-looking filter, recreated in Photoshop. Do You Need Anti-Virus Apps for Your Phone?